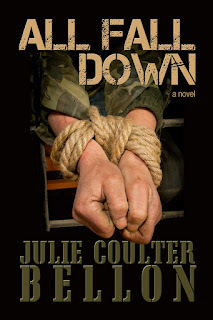 Getting Your Read On: All Fall Down by Julie Coulter Bellon: Blog Tour and Giveaway! All Fall Down by Julie Coulter Bellon: Blog Tour and Giveaway! Wow, this book jumps right into the action and suspense right away and honestly doesn't let up the whole book. It was full on. I loved it. Claire is a smart, strong woman. She knows what she wants and she just jumps in with both feet and works until she gets it. The hurts of her past motivate her to be the very best she can be in her job. I love her fierce sense of loyalty. Rafe is everything heroic and awesome. Steady, calm and strong. He is a protector and he takes his role very seriously. His loyalty and devotion to his morals, his family and his country just make him the best kind of hero. I loved this book. 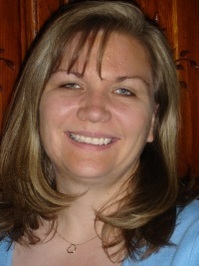 In the front of my review copy, the author, Julie Coulter Bellon wrote, "I hope you stay up late reading this one!" And I totally did! It was a fast, easy reading kind of book that kept me engaged from the very beginning. I'll never look at ring around the rosy the same way again. Thanks so much for being part of this tour Aimee! You're the best! Sounds look a book you would stay up late for! Thanks for your review! All I Want Review and Giveaway! Infraction Blog Tour + Giveaway! Loving Summer by Kailin Gow Blog Tour!